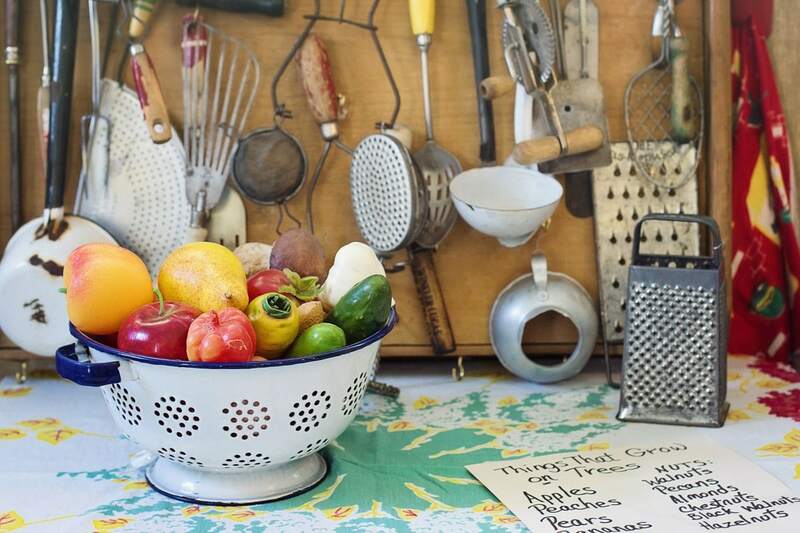 How Many of These 46 Essential Items Do You Have on Your Kitchen Utensils List? 2019 might be the year ou move house, or even buy your first home! We at Listonic believe that happiness is homemade and that the heart of any home is the kitchen. But what if, in your new home, you find yourself bereft of the means to make a satisfying home-cooked meal? We’ll make sure you’re able to get your kitchen set up and ready to cook up a storm with this essential kitchen utensils list. 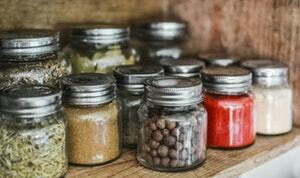 There are umpteen products that you could potentially fill your kitchen items list for a new home. Depending on your cooking abilities and tastes you may be vying for a treasure trove of kitchen tools and equipment for cooking. 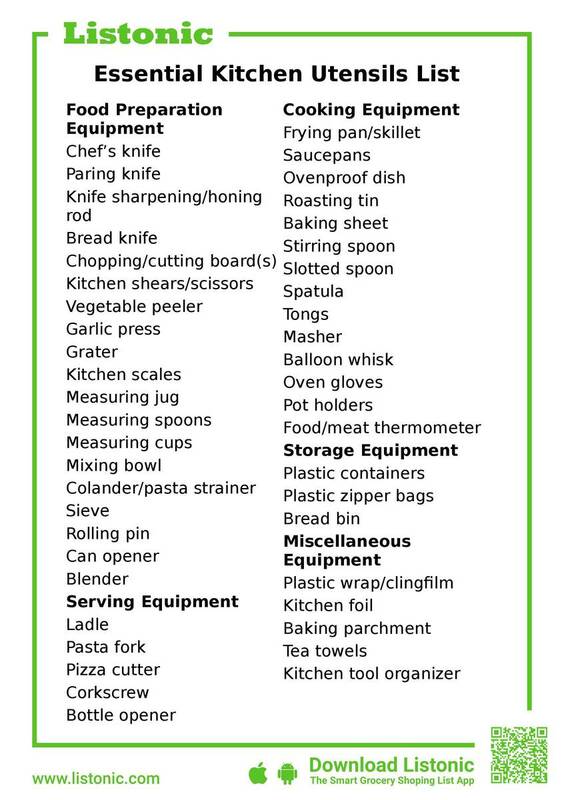 Regardless, there’s a foundation to pretty much any kitchen equipment list. Even the most accomplished culinary maestros will have these essential kitchen accessories in their gastronomic arsenal. We’ll be sure to go through the list with a fine-toothed comb so you know what you need on your essential kitchen utensils list and why. However, you can skip straight to the free printable list if you want. Don’t forget to pair it with our basic grocery list. Doing this will mean you can whip up some tasty basic meals whilst you get your kitchen up and running. 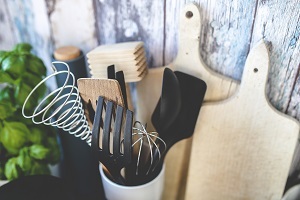 Look for items in thrift stores/charity shops – you can save a lot of money on second hand, but still perfectly good, kitchen utensils at these places. This is also great for the environment as it’s literally recycling. Ask friends and families for anything they can donate – people tend to build up a collection of bits and bobs over the years, and this includes kitchen tools. Someone might have a spare set of kitchen shears around that they might be able to donate to you or have a set of pans which they’ve never used. Check user reviews – Kitchen utensils go through a lot of hard work during their lifetimes. User reviews are a great source of sorting the decent from the flashy, especially when it comes to ranges branded with the names of famous chefs. These reviews can help you buy equipment that is good to use, and will last longer, whilst making sure what you buy within your price range won’t be a ripoff. 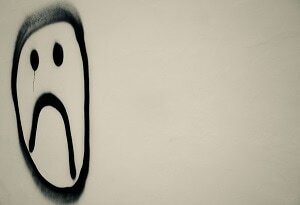 Buy the cheapest available – even if you’re on a budget, false economy is still a thing. There’s no point buying a lot of items on the cheap but finding they break or become unusable after a short while. This will mean you’ll have to go out and buy even more. But of course, don’t blow your budget. Try and get as sturdy equipment as you can. User reviews can help you when buying new equipment. You might also want to consider buying items at thrift stores/charity shops to pick up some good quality equipment at bargain prices. Buy something unless you’re absolutely sure you’ll use it regularly – there are plenty of nifty and seemingly handy kitchen gadgets and utensils out there. However, before you splurge on these, ask yourself if it’s something you’ll use a lot. If not, you’ll just end up with something that takes up space and cost you unnecessary money. But if you really want it, be sure to find recipes that will put you in the habit of using it to get the most out of it. Now, let’s got through all 43 of our essential kitchen items, whilst telling you why you should have this in your kitchen. Chef’s knife – there are plenty of different types of knives you could buy. But in reality, you only really need one or two. A chef’s knife is undoubtedly the most versatile of knives. You’ll be able to use it for the bulk of your basic cutting, slicing, and chopping needs. 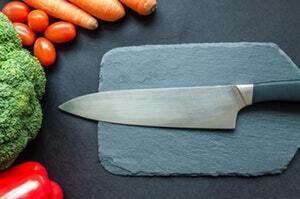 Be sure to buy a stainless steel chef’s knife to ensure it doesn’t rust easily. Paring knife – whilst a chef’s knife is indeed versatile, it can be a little on the large side. Pairing it with a paring knife will afford you the same versatility. It’s smaller in size and has a shorter blade which will give more control for more nuanced preparation. Bread knife – whilst most bread comes sliced, some certain types of bread, like focaccia and panini bread, will need to be cut open by yours truly. To do this, you shouldn’t just use any knife. The serrated edge of a bread knife will enable you to saw through it, whereas a flat knife would just squash the bread. Knife sharpening/honing rod – all knives become blunt over time, and one of these will certainly put a bit of sharpness back into them. This is particularly important if you don’t have quite enough money to really splash out on a good knife or set of knives, as cheaper knives tend to dull more quickly. Chopping/cutting board(s) – it’s no good having the best knives in the world if you’ve not got anything to prepare your food on. Whether you choose plastic or good ol’ fashioned wood is up to you. Ideally, you’ll have several boards for different type of food (raw meat, washed vegetables, fish, dairy). This can reduce the risk of cross-contamination in the kitchen which could result in food poisoning. Kitchen shears/scissors – these are incredibly versatile and can make your food preparation a lot easier. Use them to cut strips of meat, or just quickly chop up dried fruit or veg. Garlic press – whilst chopping your garlic is pretty straightforward, using a garlic press can finely mince your garlic to extract all of it’s flavor. This also reduces the risk of unexpectedly biting into a large piece of garlic in your food! 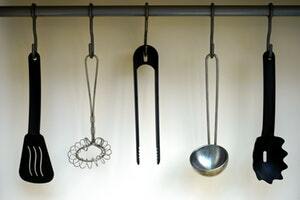 Measuring spoons and cups – Whilst most of Europe cook by weight rather than by quantity (cups) like in the US, it’s still good to get measuring cups as well as measuring spoons. This will enable you to rustle up some stateside meals without having to go through the faff of converting the recipe’s ingredients. Mixing bowl – there are times when you’ll need to combine several ingredients together. A good mixing bowl should be large enough to handle a large quantity of ingredients and also allow enough space for the mixing process. Colander/pasta strainer – use this to wash vegetables and other large objects before preparing. You can also use these to drain boiled produce and pasta once cooked. Sieve – this is mainly used for de-clumping flour when baking. But it can also be used to rinse finer ingredients, such as lentils or rice, before cooking. These would usually fall straight through a colander or pasta strainer. Can opener – whilst most cans now come with ring pulls, there are still some that require a can opener to get at their contents. A can opener is also really helpful in the event that the ring pull snaps off! Blender – some recipes, especially sauces and soup, will require you to blend the ingredients together. This doesn’t have to be some monolithic appliance that dominates your worktop. You can buy smaller and more convenient handheld blenders that do the job nicely. 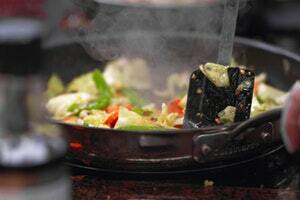 Frying pan/skillet – an essential piece of kitchenware. You can use this to shallow fry a variety of ingredients. Saucepans – whilst you will be doing a lot of cooking in the frying pan/skillet, you’ll need a high sided pan too, especially for sauces. We recommend buying at least 2 because it’s highly likely that whilst you have your sauce going in one, you’ll need to cook some carbohydrates, such as rice or pasta, in another. For more flexibility in the kitchen, buy pans of varying sizes. The type of pans you should buy will be dependent on what sort of stove tops you have. Most pans are suitable for most hobs. However, halogen and induction hobs will need thick based matt surfaces or magnetized metal pans respectively. Baking sheet – not just for cookies, but for anything that requires easy slide-off access to remove once cooked. This can also be used underneath an ovenproof dish to make it easier to remove and catch any overflowing food that occurs during the cooking process. Stirring spoon – you’ll need one for stirring your cooking. We recommend a traditional wooden spoon as it’s less likely to warp or melt in direct heat. However, if you’re too rough, or the spoon is quite old, they can split or splinter. Slotted spoon – these will be used to remove food from water. The slots in the spoon will allow the majority of water to fall away in the process. Spatula – this is great for removing food from frying pans/skillets. The slots in the spatula will allow excess grease and fat to fall away whilst removing. Tongs – these are great for lifting things out of water, or turning thick meat over in a frying pan/skillet, such as salmon fillets. Using tongs means you reduce the risk of damaging the meat as you might do by trying to slide a spatula underneath it. The best ones to buy are ones with silicone ends which are heat resistant and won’t damage your pans. They can also double as tongs to serve salad with. Masher – especially good for potatoes, but great for pulping other food such as avocado. Whilst a fork can be used to do this, a masher is far quicker and effective. However, they can be tricky to clean by hand afterward. Balloon whisk – if you’re making sauces, you’ll definitely want one of these. Admittedly, electric whisks and whisk attachments to hand blenders take a lot of effort out of whisking. But it’s still good to have one of these around in case of an emergency, or if you’re dressing as a Dalek for Halloween. Pot holders – these square pieces of fabric make it easy to remove hot pots from the stove and protect your hands in the process. Furthermore, you can place pots on them to prevent the hot surface from damaging your worktops. Food/meat thermometer – this is essential for ensuring good hygiene in your kitchen. Using one of these can ensure that food is cooked properly and all the way through, decreasing the risk of under-cooked food and food poisoning. Pasta fork – admittedly, this looks more like an odd shaped spoon than a fork. 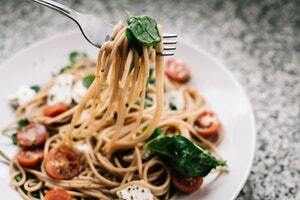 However, it’s incredibly handy for removing and serving pasta such as spaghetti and linguine that would otherwise go through the holes of a pasta strainer/colander. Pizza cutter – even if you don’t admit to eating much pizza, these are quite good to have. They can also be used to divide up flatbread. Corkscrew – although many wine bottles now come with screw caps, there’s still plenty that have a wooden or a plastic cork in them. Don’t get caught out by not having one of these about the house. Plastic containers – these are great for keeping food and leftovers fresh in the refrigerator. They can also be used for freezing leftovers in the freezer. Make sure you buy some that are also microwave safe to add even more versatility to them. Plastic zipper bags – great for storing prepared ingredients in the fridge or freezer. These also tend to take up less space than plastic containers but aren’t great for liquid. 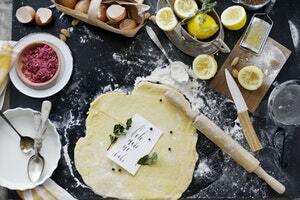 Baking parchment – if you’re planning on doing a lot of baking, this is a must. This grease-propelling paper will ensure things don’t stick where they shouldn’t. Tea towels – these aren’t just for drying up dishes. They can cover food without risk of trapping too much moisture, which is essential in the preparation of some dishes. Kitchen tool organizer – lastly, you’re going to need somewhere to put all of these utensils! Whilst some can easily be put in a drawer, some are better placed in preparation and cooking areas for quick and easy access. We recommend buying 2 because this will mean they’re not so tightly packed that they become difficult to remove. Alternatively, you can have ones in each area of the kitchen (prep and cooking). Please feel free to download and print out this free shopping list template, and make adjustments where you feel fit. We hope that it helps you set up a gleaming new kitchen in your brand new home. Are there any other pieces of kitchen equipment that you think are a must? Do you prefer a handheld blender to a large worktop one? Do you store bread in a bread bin or not? Let us know in the comments.